Pho, in all of its glorious forms, has shed its humble beginnings and become a mainstay in kitchens the word over. Born in the practical kitchens of Hanoi and refined in the cosmopolitan restaurants of Saigon, the soup is both simple—and complex. 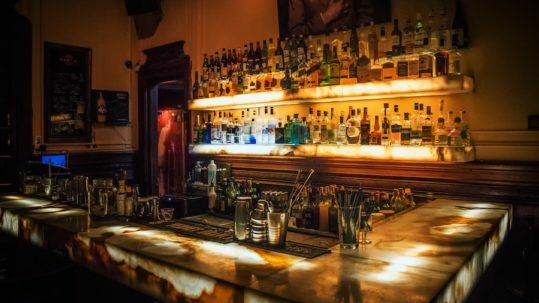 Its flavors draw on Vietnamese, Chinese, and French influences. Not surprising considering Vietnam’s long history of colonial occupation. Pho is the embodiment of the competing culinary influences that have swept through Vietnam. And like Vietnam, it will continue to evolve as new influences pour in. For that reason, the recipe below is an outline. It will guide you through the typical ingredients and techniques used in making pho. The finer aspects of the recipe, however, are for you to explore. There is nothing inherently difficult about making this soup. The most trouble you will have will likely be from finding the proper ingredients. Most are available from your local Asian market. Otherwise, they can be ordered online. The stock, like any other, begins with boiling bones over an extended period of time. Naturally, you should rinse and parboil the bones to help reduce impurities. Occasional skimming and a low temperature will ensure a clear broth. If you are in a pinch, or willing to trade some flavor for convenience, you can begin with store bought beef stock, preferably low sodium. Fish sauce, added later, is typically high in salt. To the stock above, you will add onion and ginger. However, technique is important here. First, you must char the onion and ginger. This releases their aroma adding sweetness and complexity to the broth. It is essential for a classic Pho flavor. Charring can be done a number of ways. Stove top, broiler, open flame, grill, etc. Don’t over think this part. Char the onions and ginger until the outsides begin to blacken and you begin to smell their aroma. Once charred, peal the onion and ginger and add them to your stock. This is the fun part. You must add a combination of spices to flavor the dish. The most common are star anise, cloves and cinnamon sticks. These spices are the essence of this soup. Other common spices are fennel, cardamom, and coriander. Our suggestion is to pick a blend that suits your palat. Begin adding the spices to a bowl until you have the desired bouquet. Begin with the star anise, which is the essence of every pho recipe. Next add some cloves. While not as essential as star anise, they are found in most recipes. Lastly, try some cinnamon. While not in every pho recipe, it is quite common. Lastly, try some fennel, cardamom, or coriander. Once you have your desired bouquet, toast the spices in a pan or oven until they begin to release their aroma. Then add them to the stock. Use a cheese cloth or strain them out when finished. The stock should cook between 4 to 6 hours. This gives the ingredients time to develop. It should be rich, aromatic, and complex. As the broth comes to a finish add some fish sauce to taste. Then add a touch of yellow rock sugar for sweetness and complexity. When finished the broth should be a clear amber color. Rice noodles for pho can be found in most local Asian markets. In certain regions, they are increasingly common at your neighborhood grocery store. The noodles are sold three different ways. In the dry packaged noodle isle, semi fresh and fresh in the refrigerator section. Fresh noodles are only common in areas with a large Vietnamese population. Most restaurants use semi fresh noodles. Pho is highly versatile. 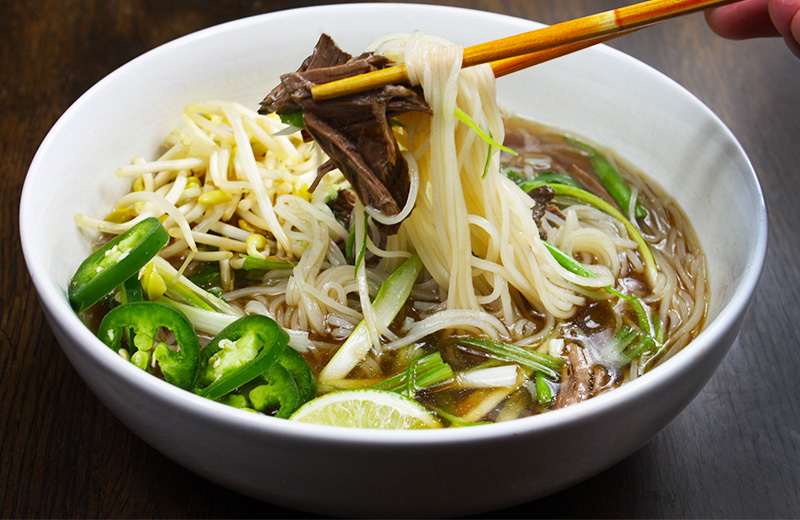 Most restaurants serve their pho with a blend of classic Vietnamese toppings along with local regional favorites. 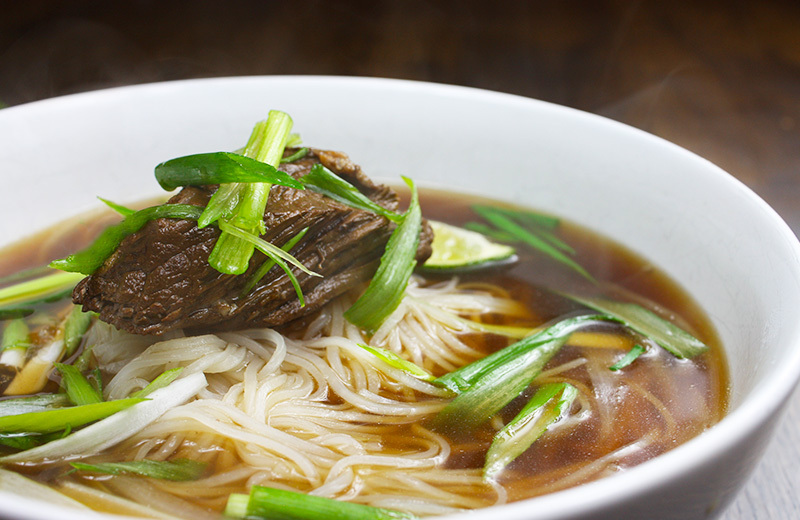 Traditional : If you’re a traditionalist, try topping your pho with sliced rare beef (Pho Bo Tai) or Beef Brisket (Pho Gau). Other classics include beef meatballs (Pho Bo Vein) and flank steak (Pho Nam). 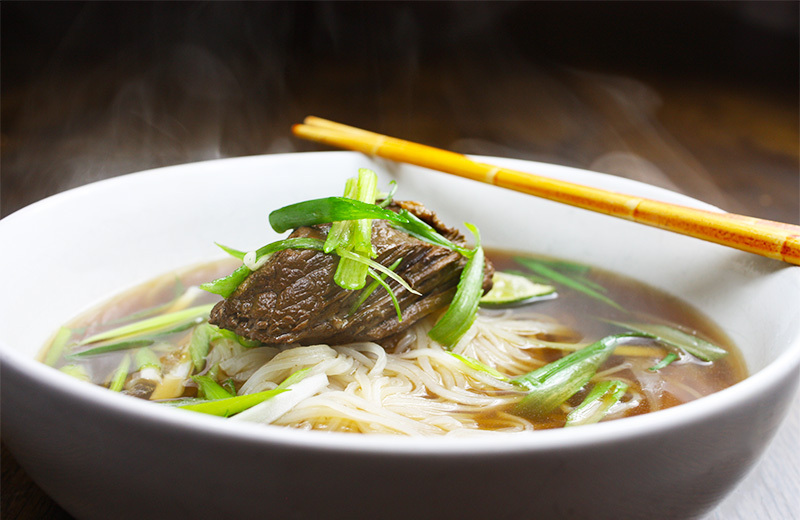 More adventurous eaters may try beef tendon (Pho Gan), tripe (Pho Sach), or oxtail (Pho Duoi bo). 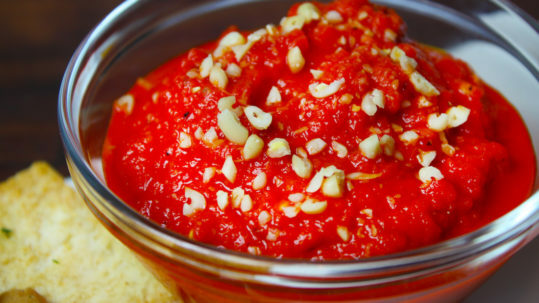 Other Toppings : Other favorites include vegetables, veal, tofu, seafood, and even lobster. Chicken (Pho Ga) is another favorite, but is generally served in a chicken broth. For many, the most enchanting part of pho is all of the herbs and condiments. One could eat pho every day for the rest of their life and never have the exact same dish twice. 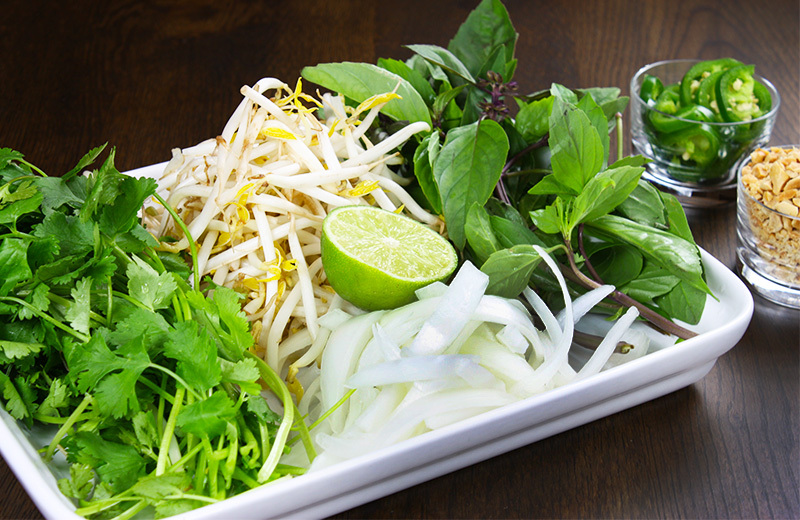 The most common herbs and condiments served with pho are thai basil, cilantro, lime and bean sprouts. Others include mint and dandelion leaves. 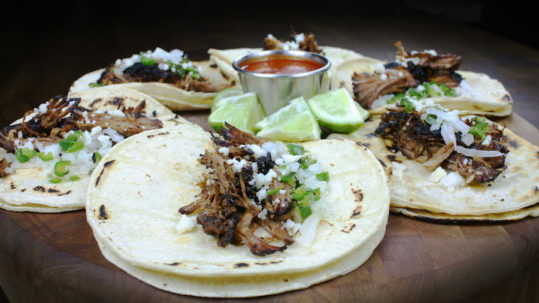 For a little heat, you should also serve chili; jalapeno, birds eye, or serrano.